The much anticipated feature film of Vera Brittain’s Testament of Youth was shown in preview at the British Film Institute 12th January, and is now out on general release. The film is both moving and beautiful to look at. The cast, including Emily Watson and Dominic West as Vera’s perplexed parents, are universally good. Swedish actress Alicia Verkander captures well Vera’s brittle intensity, youthful self-absorption, fierce intelligence and ambition, refusing to conform to the social norms expected of a genteel young woman of the time, through to her growing awareness of the vast numbers of casualties, and those ‘fallen in combat’ – page after page of names published in the newspapers, and the overhead scene of rows and rows of men on stretchers, filmed in homage to Gone With The Wind. We follow the development of her close friendship with her brother Edward (Taron Egerton) and the two young men sweet on her, one of whom she spars with on a subject dear to her – the writing of poetry. He, Roland Leighton (Kit Harington), is of course the one she falls in love with. Colin Morgan is splendid as the sensitive other suitor Victor Richardson. It is beautifully costumed, with romantic shots of both the captivating and expressive beauty of Vikander and the English countryside. We see that, in accordance with sensibilities of the time, she and Roland could only meet when accompanied by a chaperone (amusingly played by Joanna Scanlon), and that she is recalled from her nursing duties abroad to look after her mother after she has a breakdown – which really meant she was expected to keep house – though, I would have loved to see the argument she had with her parents on a similar occasion when summoned home. She wrote to brother Edward at that time declaring that feminism could only ever succeed when daughters were no longer expected to jump to their parents’ demands in the ways that sons were not. Inevitably, when creating biographical account, the writer needs to choose which aspects of a subject’s life to highlight. In this case, the love affair takes central stage, though as Vera’s daughter Dame Shirley Williams pointed out in the discussion after the preview showing, Vera’s feisty personality was allowed to come through, showing she was not a typical romantic heroine, something Williams dreaded the film might reduce her to. Nevertheless, there are certain historical liberties taken to highlight the romantic aspects – the real Vera did not learn of Roland’s death as a bride, nor did she nurse Edward back to health in war-torn France, but in England. These and some other artistic licenses are forgivable, but where the film definitely fell short of presenting a more rounded Vera was in neglecting to show us more of her academic and intellectual life. 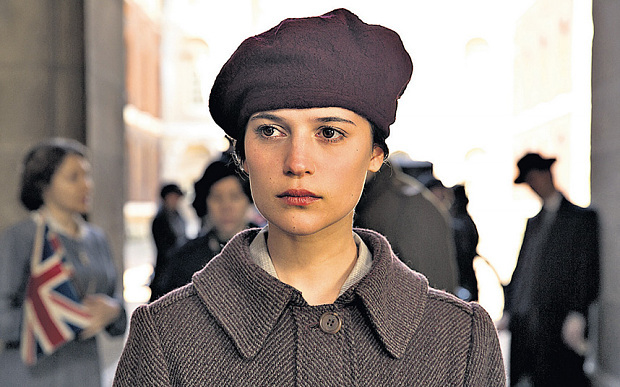 There are fascinating accounts in Testament of Youth about her discussions with fellow students on their work, though women could not then have degrees conferred on them, and quite heated letters with Roland over poetry, even after he had gone to France. I have other reservations, not least the modernity of the dialogue depicting life before the war. This, together with Vera’s rebellion against the expectations of marriage and domesticity, would have been more powerfully conveyed by a more accurate delivery of how people spoke then. This is no reflection on Vikander, whose accent for the most part is convincing and she would, I am sure, have spoken in a more period manner, if directed. The boys, however, most certainly would have been far more clipped, having been trained to be officers, and a rather more deftly written script (Juliette Towhidi) could have employed more contemporary, less modern, language. Paradoxically, this would have revealed Vera’s modernity with greater force. The heart-breaking sadness of her losing one by one these dear friends and her brother, the relationship with her tart Oxford tutor (impeccably portrayed by Miranda Richardson), and the beginning of her close friendship with fellow student Winifred Holtby (Alexandra Roach) are well depicted, and the scenes showing Vera nursing a German soldier and her later address of a public meeting espousing pacifism bring home to us her courage in opposing the then commonly held notions of Germans and their country’s swingeing reparations . We see here the spirit which led Vera later in life to be still out of step with many of her contemporaries. Although the film brings a lump to the throat, there is a certain amount of emotional punch missing. It might, perhaps, be lacking in enough wit and humour. Director James Kent is an admirer of Gone With the Wind, and there are similarities, not only in the stretcher scene mentioned above. Margaret Mitchell’s heroine Scarlett O’Hara also defied convention and began to grow up when faced with attending a hideous unsterilized and un-anaesthetised leg amputation. Yet, somehow, the contrasts between the cloying and restrictive niceties of domestic society, and the appalling reality of war, are rather better made in David O. Selznick’s film. Nonetheless, Testament of Youth is both affecting and enjoyable, and revealing of some of the effects the Great War was to have on women and society in general. It is wonderful that a woman’s account of the Great War is dramatized and celebrated. Their stories, a subject close to my heart, have for too long gone unrecorded and unrecognised. This at least helps redress some of that imbalance, and for that it must be applauded. This entry was posted in Film reviews and tagged Alexandra Roach, Alicia Verkander, Collin Morgan, Dominic West, Emily Watson, fiona jane weston, Gone With the Wind, Great War women, James Kent, Joanna Scanlon, Juliette Towhidi, Kit Harington, Miranda Richardson, Shirley Williams, Taron Egerton, Testament of Youth, Vera Brittain. Bookmark the permalink.